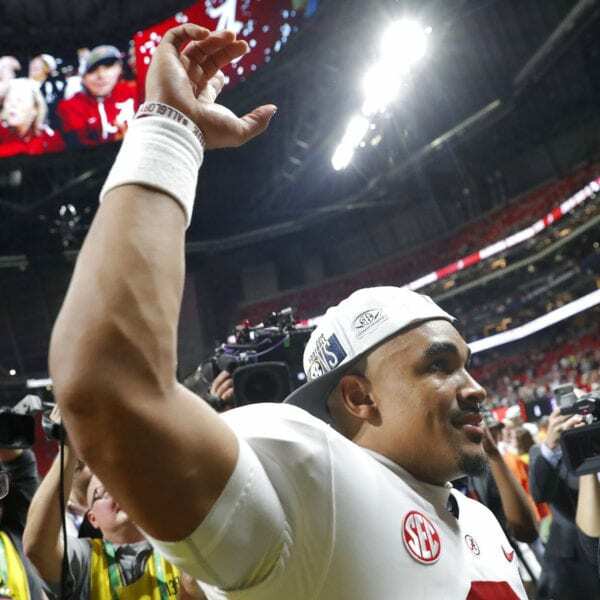 ATLANTA (AP) — Jalen Hurts spent most of the season watching from the sideline, cheering on the guy who took his job and hoping for one more chance to lead the Alabama Crimson Tide. He didn’t pout. He didn’t gripe. He didn’t transfer. On Saturday, Hurts got the call. Hurts threw for one touchdown and ran for another with just over a minute to go, rallying No. 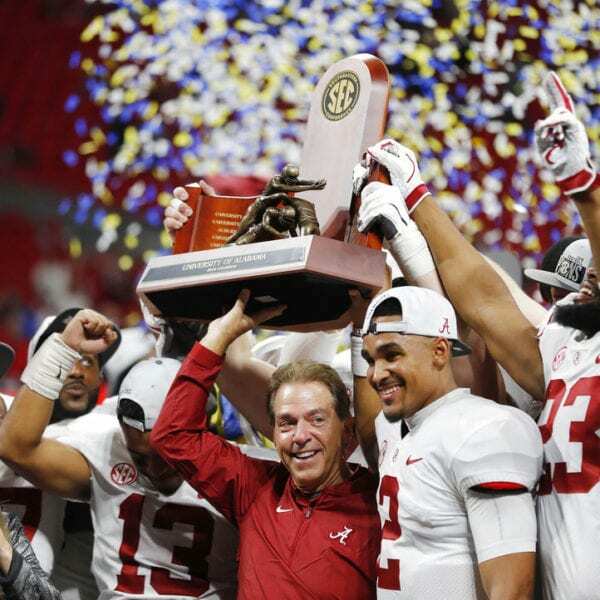 1 Alabama to a 35-28 victory over No. 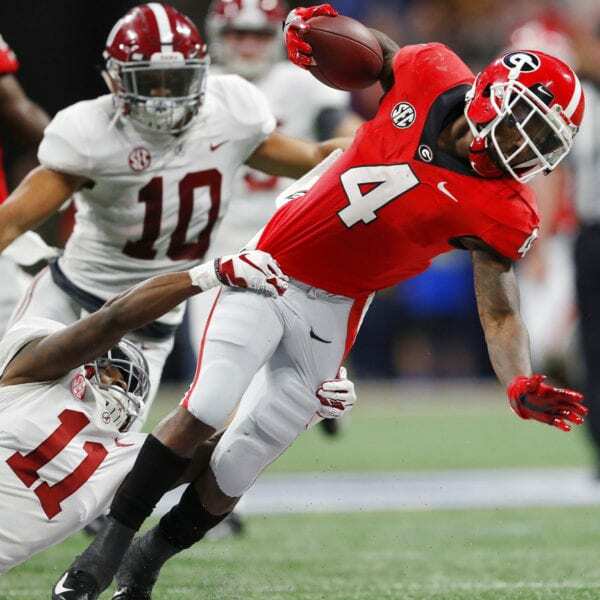 4 Georgia in the Southeastern Conference championship game. It was a stunning twist on the scenario that played out less than 11 months earlier on the very same field. 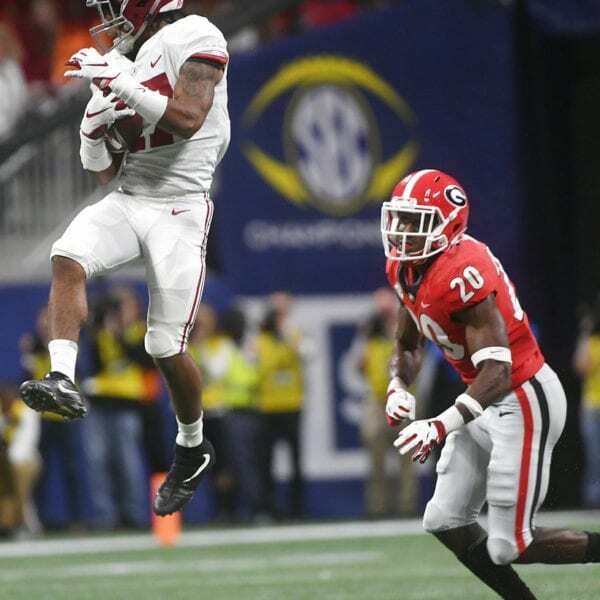 “I’ve probably never been more proud of a player than Jalen,” coach Nick Saban said. If they had pitched this script to Hollywood, it would’ve been laughed out of the room for being too implausible. 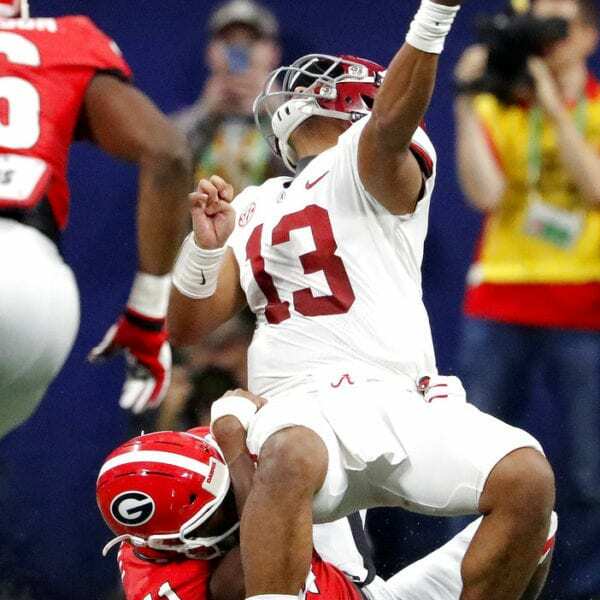 In last season’s national title game at Mercedes-Benz Stadium, between these same two teams, Tua Tagovailoa replaced an ineffective Hurts at the start of the second half with Alabama trailing Georgia 13-0. 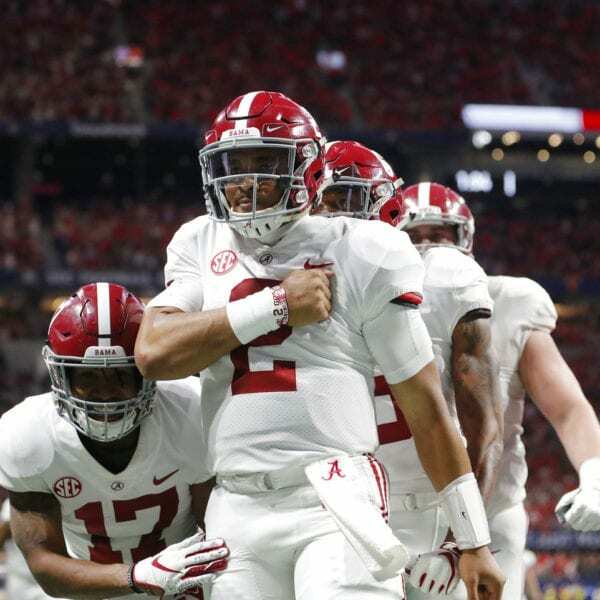 The replacement threw three touchdown passes, including a 41-yarder in overtime that gave the Tide a stunning 26-23 victory. 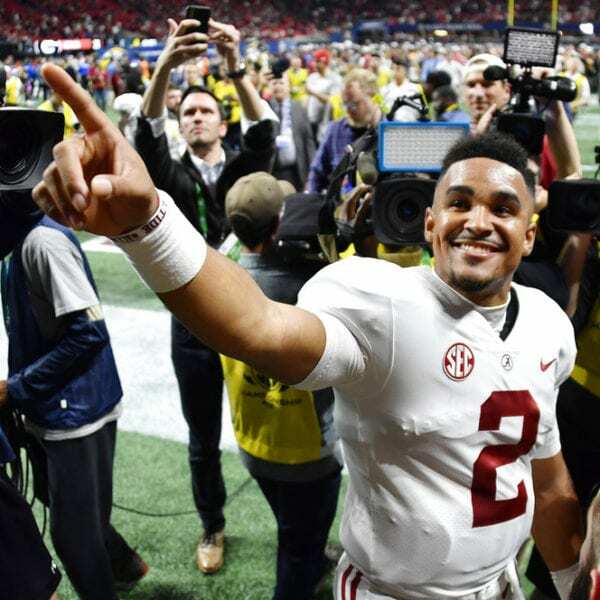 Tagovailoa won the starting job outright heading into this season and performed brilliantly before Saturday, throwing 36 touchdown passes with only two interceptions. 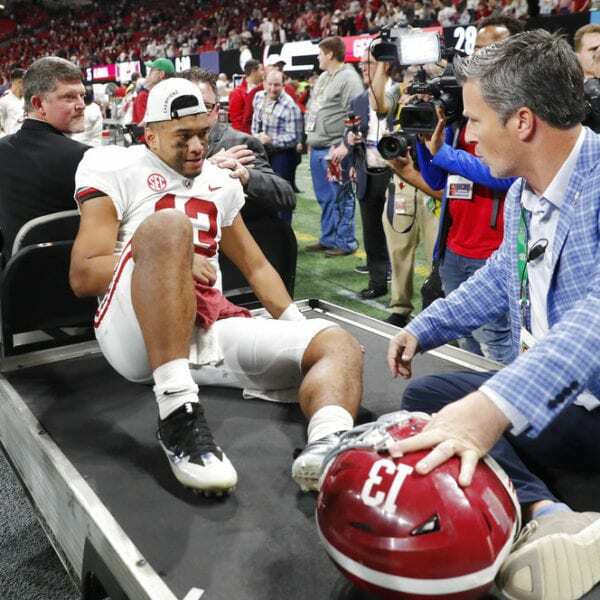 Finally, with just over 11 minutes remaining, Tagovailoa went down for good after one of his own linemen stepped on his right foot as he attempted to throw. 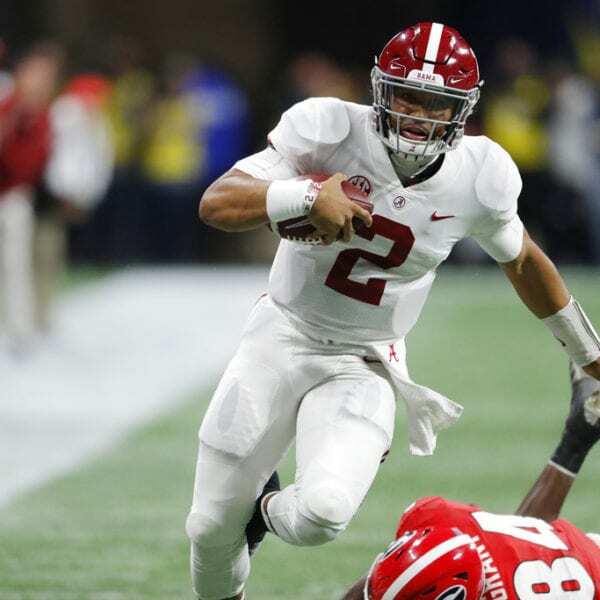 Enter Hurts, who posted a 26-2 record as the starter before Tagovailoa claimed the job. He calmly guided the Crimson Tide (13-0, No. 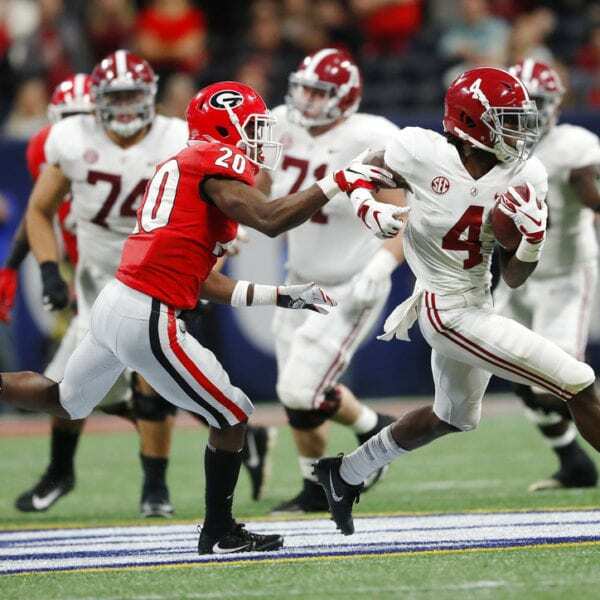 1 CFP) to a game-tying touchdown with a 10-yard pass to Jerry Jeudy, capping a 16-play, 80-yard drive that consumed more than 7 minutes . Hurts completed 7 of 9 passes for 82 yards, to go along with five carries for 28 yards in less than a quarter of action. “It kind of feels like I’m breaking my silence,” Hurts said. He spoke loud and clear against the Bulldogs. And when he trotted off the field after the winning TD, Tagovailoa was one of the first teammates to greet him. 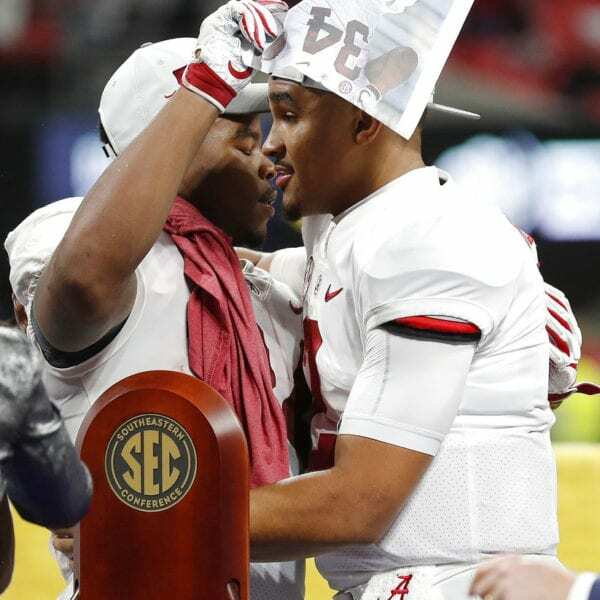 Afterward, they stood side-by-side on the podium in the middle of the field while Alabama received its SEC championship trophy. 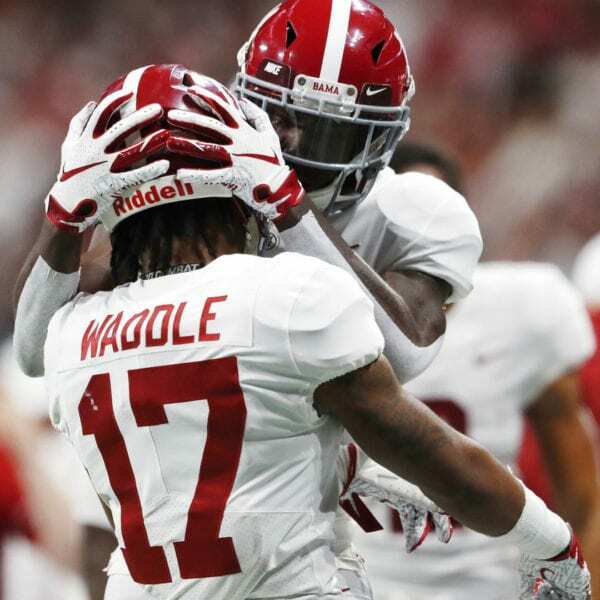 The Crimson Tide is headed back to the College Football Playoff, looking for its second straight national title and the sixth of the last decade under Saban. 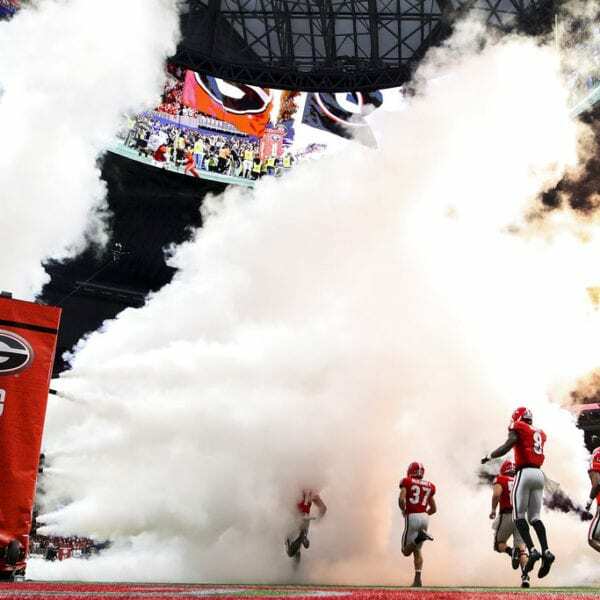 Georgia can make a pretty good case for the playoff, too, but the Bulldogs will likely get left out. Big 12 champion Oklahoma (12-1) avenged its only loss by beating Texas, and Ohio State (12-1) knocked off Northwestern in the Big Ten title game. This was another galling loss for Saban’s former assistant, Kirby Smart. He’s quickly built Georgia into a national powerhouse, but he keeps coming up short against his ex-boss. For the second time in less than a year, the Bulldogs squandered a double-digit lead to the Crimson Tide. While this one didn’t end with the suddenness of that national title game, it hurt just as bad. The Bulldogs had another chance to knock off the team that had been No. 1 in the polls all season, a team that has built perhaps the greatest dynasty in college football history. 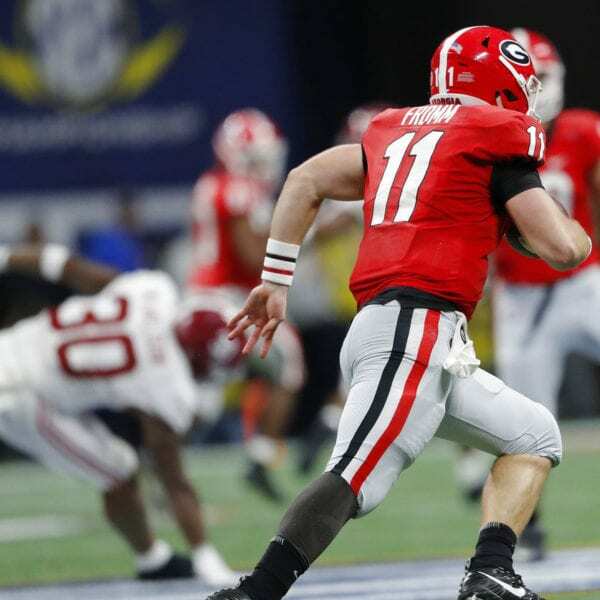 Jake Fromm got the best of his duel with Tagovailoa. 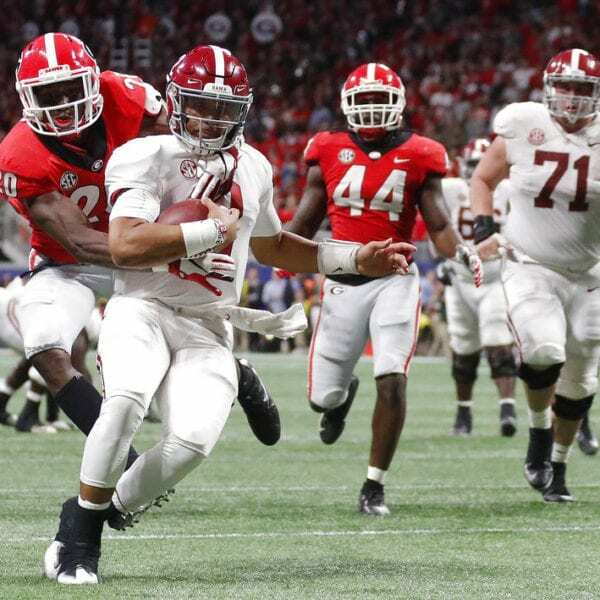 Georgia’s sophomore quarterback threw for 301 yards and three touchdowns, while Tagovailoa was only 10 of 25 for 164 yards. 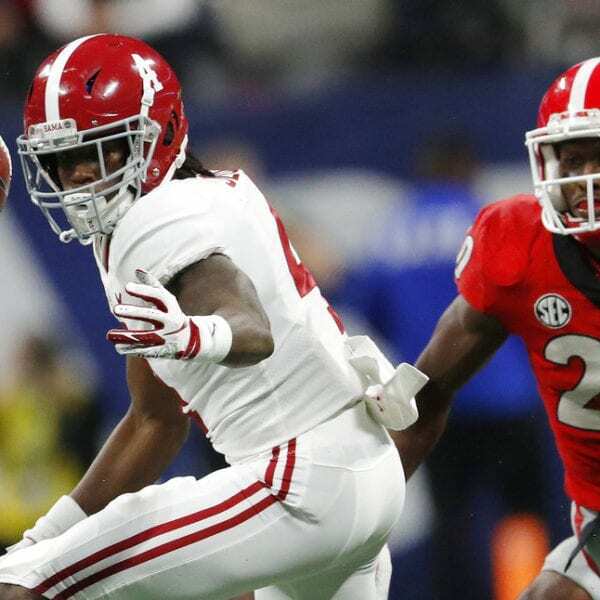 The Alabama QB did spark the comeback with a short pass to Jaylen Waddle that resulted in a 51-yard touchdown late in the third quarter, cutting Georgia’s lead to 28-21. With the game tied at 28, Georgia raced fourth-and-11 at its own 50. The Bulldogs lined up for a punt that could’ve put the Tide in a deep hole, but Smart inexplicably called for a fake punt. Backup quarterback Justin Fields took a direct snap, looked to throw and then took off running. He was quickly swarmed by the Tide defenders, gaining only 2 yards. “Look, I wasn’t coming here to play to tie,” Smart said. 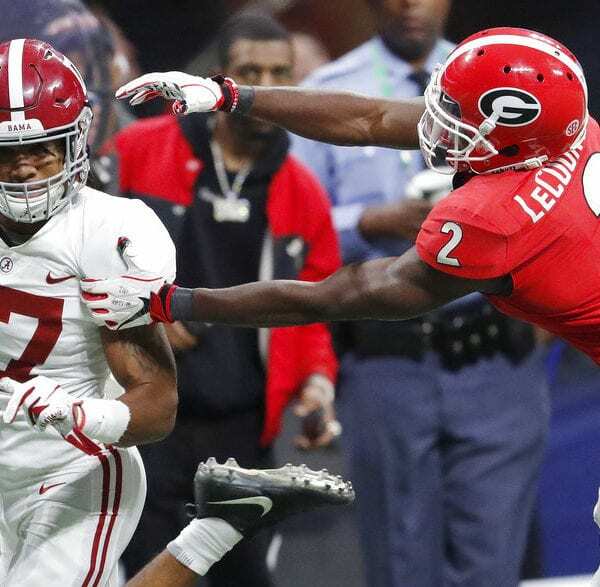 Alabama: This was the sort of challenge that should serve the Crimson Tide well in the College Football Playoff. 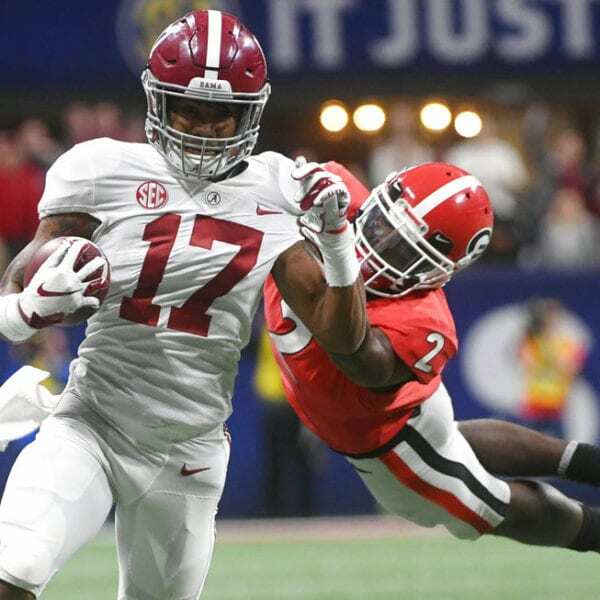 The Crimson Tide had not been in serious trouble all season, beating everyone by at least 22 points, but they showed plenty of grit when finally challenged by the Bulldogs. 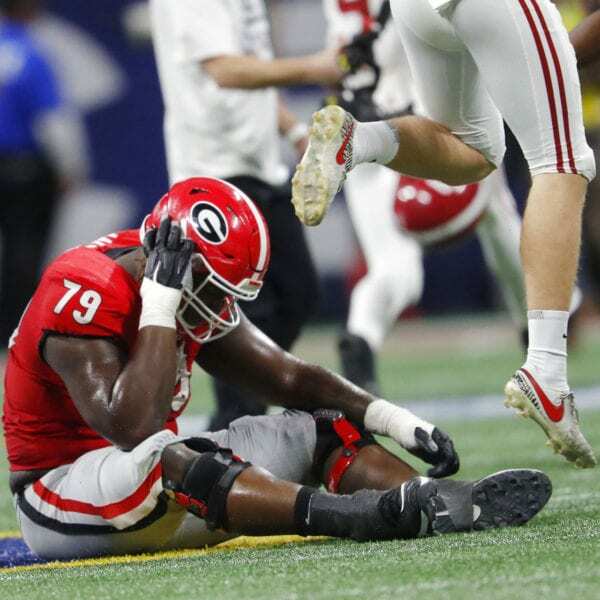 Georgia: The Bulldogs will be kicking themselves for the way they let this one slip away. Twice, on third-and-short with a chance to extend drives, they failed to convert. And that fake punt will go down as one of Smart’s worst blunders. Be the first to comment on "Hurts Rallies No. 1 Alabama To 35-28 Win Over No. 4 Georgia"